It feels a little silly to include Star Wars in a compendium of films you must see, if only because it’s a given that everyone’s already seen it. When someone tells me they haven’t seen Star Wars, I briefly consider whether or not they could be an alien (which, in retrospect, is slightly ironic given the subject matter). But these films are that ingrained into our culture and into our childhoods. When someone mentions Darth Vader, Tatooine, Yoda, the Death Star, or The Millennium Falcon, what images and experiences come to mind? No movie is more quotable, more accessible, more iconic, than Star Wars. What must it have been like to be a kid (or a nerd – they’re practically the same thing) in 1977? Never before had a movie been so breathtakingly big, so shamelessly and wondrously entertaining. John Campbell’s archetypes, Akira Kurosawa storytelling, universe-spanning Trekkian locales, a knowingly corny Flash Gordon-esque sense of humor, and state of the art special effects and production designe fused to create what might have been the first true spectacle (argue Gone with the Wind and Lawrence of Arabia if you like). A sweeping romance. A swashbuckling adventure. An underdog story. Star Wars is all these things and more – three thousand years of storytelling in a vacuum. And yet, it feels completely and refreshingly original, even with the plethora of cheapskate copycats produced in the thirty-five years since. When Luke walks into the Mos Eisley Cantina for the first time to witness a lively melting pot of vivid creatures and extra-terrestrial jazz, we know there’s something special going on. Only in the movies could there exist a place where droids are strictly prohibited but murder is treated with a passing curiosity. It seems needless to introduce the plot and characters, but I shall trudge forward. 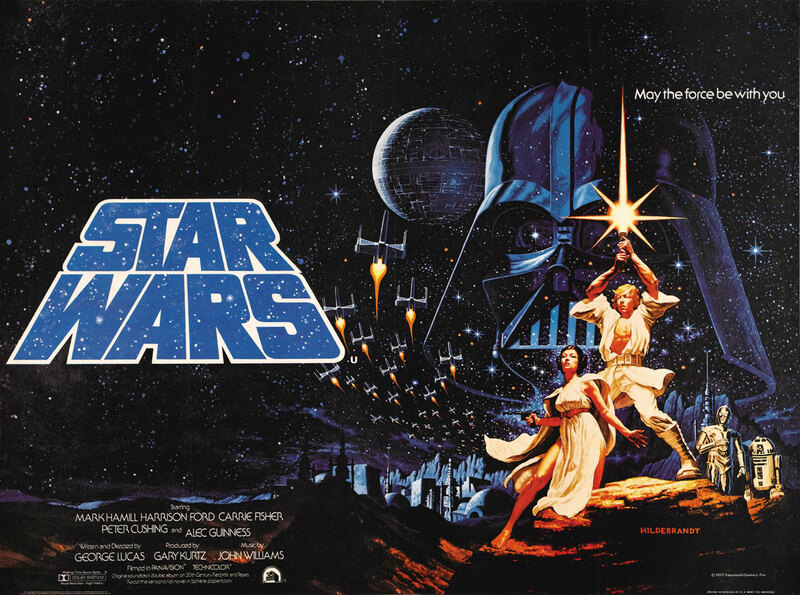 The film opens with the trademark Star Wars title crawl, followed by the iconic extended shot of the massive Imperial Star Destroyer as it pulls in the beautiful and willful Princess Leia Organa’s (Carrie Fisher) starship into its docking bay. Her two droids, C-3PO (Anthony Daniels) and R2-D2 (Kenny Baker) have been entrusted with pivotal information about the Empire’s new space station, the Death Star, which has the power to destroy whole planets with a blast from its laser ray. The hell of a lot of jargon and inventive science fiction names make for an immersive (and difficult to pronounce) experience. But one never feels left behind – the visual imagery is clear and tactful. Take, for instance, two moments in the opening sequence. There’s the famous scene in which the hulking and infamous Sith Lord Darth Vader (David Prowse, with the chilling voice of James Earl Jones) is glimpsed for the first time. He walks down a hallway filled with dead enemy troops, and almost imperceptibly glances at them. Why on earth would he do that? We get a subtle hint of what’s to come, and on the overarching themes of the series – the ideas of pure good and pure evil, and that both can live in one man, and that in each of the characters a leader and hero is waiting to break free. Meanwhile, C-3PO and R2-D2 are traversing the pellmell havoc of battle. There’s a great comic moment when the two cross a starship corridor as blaster fire rattles across on either side. But it hints at so much more, and so simply we don’t even realize it. We instinctively realize that these are two characters who will survive, and who will be in the thick of the action. They are perhaps the best odd couple, ever. R2-D2 cannot speak and is impulsive and intelligent, while C-3P0 is talkative, cautious, and generally ignorant to the minutiae of any given situation. The duo land on Tatooine, a desolate desert planet with twin suns. They’re quickly picked up by the curious Jawas, which is George Lucas’s answer to the Munchkins – meaning nomadic traders who place captive droids in the holds of their massive Sandcrawlers. The two are serendipitously sold to our dashing hero Luke Skywalker (Mark Hamill), who’s restrained from becoming a pilot for the Rebellion. While tinkering with R2-D2, Princess Leia’s iconic plea flickers on before his eyes. “Help me, Obi-Wan Kenobi. You’re my only hope.” Luke’s led to Obi-Wan Kenobi (Alec Guinness), an old hermit and former Jedi Knight (!) who knew Luke’s father. Guinness’s entrance is carefully constructed, and one of the best in movie history. John Williams’ breathtakingly operatic score is never better then when softly humming here. Before we know it, Luke – and the audience – has been swept up in a grand adventure. Guinness brings his usual restraint and majesty to the role, with his soft, crackling voice and wry half-smile. The third iconic entrance in the film (after Vader and Obi-Wan) is the inimitable Han Solo. Charming and crass, this is Harrison Ford’s defining role. Accompanied by cohort Chewbacca (Peter Mayhew), spice smuggler Han agrees to smuggle our heroes off of Tatooine to rendezvous with the Rebellion and return the secret plans to Princess Leia. The now famous encounter with amphibian bounty hunter Greedo (and the Who Shot First? debacle) might just be the official birth of the newly minted antihero. The performances are unusually charismatic for sci-fi films of the era. Mark Hamill fits the bill as the relatable everyman, and Carrie Fisher brings sass and wit to Princess Leia. The dialogue is replete with sly in-jokes and flirtatious banter between Han and Leia. When I looked on IMDB’s quotes page for the film, I saw almost the entire screenplay in bits and pieces. Go to a random scene, a random line, and odds are it’s famous. This film’s direction is marvelous, perhaps because it was made before Lucas knew just how well-loved Star Wars would be. He’s not afraid of knowingly cheesy lines and moments, and there’s a beautiful naivety to the whole show. The Force I love this movie. Never mind what you think of the prequels or of the effects of Lucas and Spielberg on modern cinema or of the recent Disney deal. Star Wars is magic, plain and simple. When you watch, a smile is perpetually etched across your face and your eyes are wide with wonder. One of my worst (and favorite) Clichéd Critical Copouts is taking a quote from the film and calling it representative of the film as a whole. I’ve been trying to reduce my usage of Clichéd Critical Copouts, but this is simply too good an opportunity to resist. “You have taken your first step into a larger world,” says Obi-Wan to Luke. When kids are watching Star Wars, they certainly are. This was the film that made me seriously passionate about storytelling and about movies. This was the film that made me spend hours poring over reference books looking up the species name of an arcane species to settle a debate with my friend. This was the film that made my childhood special. 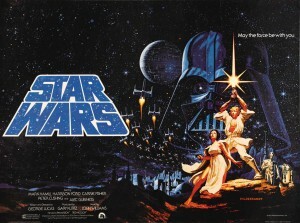 FINAL SAY: Star Wars is the ultimate nerd fest – an epic and intimate masterpiece of pulp fiction and escapism. Insanely quotable and instantly lovable, this is one that’ll live on in the hearts of both adults and kids alike for a long, long time. Next ArticleGrace Doll Blog Tour: Jennifer Laurens' Grace Doll Playlist!